Or at least that’s what it felt like when Ali and I finished the trellis we put up in the pea bed. I had seen a photo of a similar trellises in an email from Kinsman garden supplies about twine and it got me all excited. Loads of time went by and the trellis was a perennial to-do list resident, but yesterday we finally did it. Ali pounded our giant rusty nail deep into the ground and pulled it out, leaving a perfect sized hole for me to drive in the stakes. Then I got busy with the twine, and all told in about an hour victory was ours. And I do feel utterly victorious. This is because I set the bar very low, and I’ll tell you something, I think that’s the secret to my personal happiness. The less I expect, the more gratified I am. 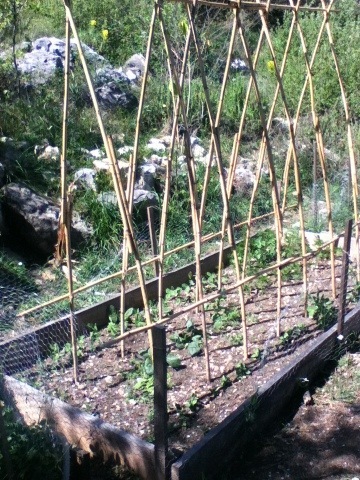 So when I crossed “pea trellis” off the list, it was with tremendous satisfaction. Which brings me to the list itself. I always write lists for absolutely everything, but gardening has made me consider very carefully how I phrase my list items. “Water” or “weed” for example, are terrible candidates because they are never-ending jobs. “Dig corn bed,” on the other hand, is a tidy, achievable little task (that I crossed off the list over the weekend). Again, aiming low. So this is how I am sailing through Spring, celebrating every tiny achievement and setting new, low hurdles for the days to come. Here’s a closer view of my grand architectural achievement, with it’s neat rows of peas (very sorry pea roots, we won’t be so late next time) and a random scattering of spinach and carrots (the chickens got in and kicked things up a bit). I’ll put some cucumbers in the bed later in the season. May your day be full of little victories! Thank you! I thought I’d patted my own back enough, but it’s always nice to have company. The trellis might be tied with string, but I think it will stand up to inclement weather since we drove the stakes in pretty deep. Plus, all those cross supports- i could feel the while structure getting more solid with every piece of string I added. We will see in the fall when we get our howling winds! I just have to say, too, that I love the word chooks. Thank you! Thanks for stopping by. 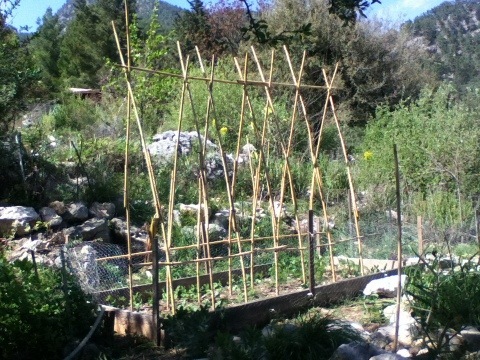 Love how your trellis look. Yes, reminds me of a cathedral. I too tend to do small tasks one at a time, makes me feel I have accomplished something. If I still have time and energy left, I will do a bit of weeding (that is never on my to-do list). Ha! I always have that problem with to tomatoes- I try to keep seedlings labeled, but always end up with staked determinate or stakeless indeterminate tomatoes. Never mind! Thanks for returning my visit- I look forward to reading more from you.